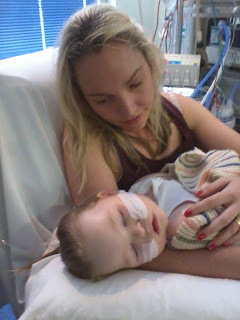 My AMAZING BABY GIRL is spending her fifth day in the Intensive Care Unit at the Mater. Tuesday morning started with an ambulance trip to the hospital as Stella wasn’t responding to anything. After four days of utter gloom and sadness my princess has once again astounded the doctors and she is breathing by herself, opening her eyes and looking around. I am just so bloody proud of her, I want the whole world to know how strong, brave and courageous my daughter Stella is. Stella continues to amaze everyone. She is the strongest little girl, a little miracle, a little star. So glad you got to cuddle Stella yesterday, Chelsea. I'm sure she enjoyed it as much as you. Thinking of you all and praying your gorgeous girl is well enough to go home soon. What a little fighter you have. I know its not much but please know that I'm sending you all my love and prayers. Your lil girl has beaten this before and will do it again. When we met years ago I was and still am amazed at your drive, resilience and sheer strength, you have passed this on to Stella because I can see it in her. It shines through in the stories you tell of the battles she has defeated time and time again. Love you all - please let me know if there's anything at all I can do, anything!! Prayers and love for the brightest little star in the dark of night!! Praying for you all Chels. Stella is definitely a little fighter. Well said Cindy! Chels your spirit does burn bright in your beautiful little girl - she is amazing. you get em bub, show those docs up. we pray nearly every night on the star that shines the brightest wishing you are out of harms way cos this little star does shine the brightest. we love you so much stella, keep up your strength and courage. lots of love uncle rich and aunty kristy. Just came across your blog on FB. I thought you might find this useful? I am a Chinese medical practitioner in Helensburgh. I used this product called CN nutrition on a dog with a Mitochondrial disease. She could only walk for about 200 meters and when she is on this stuff she runs, runs and runs. She has her life back. It might be worth looking into as it specifically works on the Mitochondria thus helping to produce more ATP (energy). I wish you and your beautiful family all the best. I would be interested to hear how she goes on it if you decide too. sending love and light your way, your little Stella is a fighter and i hope she continues to fight on and amaze her Dr's.